This article was written by CNET News.com's Daniel Terdiman. 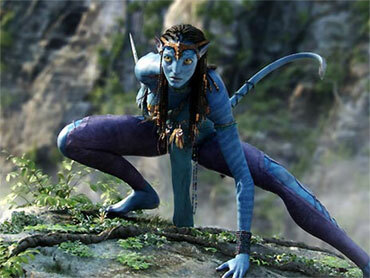 Since the release of his massive hit "Avatar," director James Cameron has gotten plenty of deserved attention for his filmmaking innovations, having invented a camera system that captured live footage of his actors and integrated it immediately into fleshed-out scenes from his fictional world of Pandora. But movies may not be the only medium Cameron's innovation is pushing toward the future. In fact, the technology he and his visual effects partners built for the record breaking film may also provide our first real glimpse of the future of 3D virtual worlds. Today's virtual worlds have attracted millions of users, significant venture capital and sometimes impressive revenues. But some experts think it's a no-brainer that augmented reality tools like Cameron used to turn "Avatar" into history's highest-grossing film could soon be the core of what millions of people experience in 3D virtual worlds that until now, we've only been able to dream about. Today, the term "virtual world" means a lot of things to a lot of people. To many, it means 2D online social games like Gaia Online or Club Penguin. To some, it means large-scale massively-multiplayer online games like World of Warcraft. And to others, it's open-ended 3D experiences like Second Life. After Second Life took the world by storm in 2005 and 2006, introducing many to a 3D environment in which they could create nearly anything they wanted, there hasn't been a major next step forward. One could argue that virtual worlds have even taken a technological step backward, as most of the energy in the space these days is being put into building 2D Flash worlds for kids, or Facebook games played by the masses. It's big business, but hardly cutting edge. To virtual worlds expert Bruce Damer, however, what Cameron created for "Avatar" is the first peek at a tremendous leap of innovation, one in which huge audiences could be using virtual worlds that feature vast arrays of content and data coming in from sources like Disney and Google, or individual users themselves, and devices like Cameron's "Avatar" camera, iPhones or car windshields with augmented reality overlays. And everything and everyone in between. "If you combine the Wii or (Microsoft's Project Natal) with augmented reality glasses or...just (hold) up your smart phone, you will 'see' into the virtual world that is cast all around you," said Damer, the author of the 1997 book "Avatars." "In Vernor Vinge's superb novel 'Rainbows End,' the characters use a kind of contact lens that gives them a parallel vista into the virtual landscape mapped around them on the physical landscape." Damer pointed to an iPhone app that you point at the sky, which shows you all kinds of information about the stars and constellations you're looking at. "That is the beginning of ubiquitous augmented reality and virtual worlds," Damer said. It's not to say that Cameron's specific innovation will be implemented in any particular virtual world. Rather, technologies like what Cameron built for "Avatar" may someday become part of the mainstream experience of blending data coming in from the real world with a rich server-based virtual experience. It could be, proposed Damer, that some people would have minor demands: they'd want simply to be able to find out if a specific restaurant is open and if it serves pasta. That kind of data could come from Google, via its Street View service, but users could access it through advanced, augmented reality glasses, or via an advanced smart phone. And plenty of other low-bandwith content would also feed this system, providing the base on which to build, things like on-screen documents, data from social networks, weather information, and so on. For others, however, their demands might be more immersive: a virtual palace, a climbing gym or even a virtual representation of someone's farm, complete with avatars to welcome visitors. "It will get more sophisticated when whole worlds are mapped onto the sim-reality complete with avatars--other people--and bots," Damer said. In short, we will become immersed in it, and the input will come from all directions. That vision is not entirely new, of course. In 2007, the Accelerating Studies Foundation released the Metaverse Roadmap report, a prediction about what the 3D Web of 2016 would be like. That vision of the 3D Web imagined a combination of four types of technologies, all of which would converge in the creation of immersive experiences that would be shared by millions upon millions of people. Those technologies included augmented reality--immersive, location-aware and self-tracking; Lifelogging--technology used for always-on recording of everything and everyone around us; and "mirror worlds," advanced versions of things like Google Earth which add high degrees of context to "virtual modes of reality." In total, what the report predicted is similar to the vision of the future of virtual worlds that Damer sees emerging from "Avatar" and the technologies behind it. That's a notion that Jerry Paffendorf, one of the Metaverse Roadmap organizers, agreed with. "The world will eventually be totally cloaked in real-time graphical overlays," Paffendorf said. "In general, you can already see that trend that people like 'real things' in their virtual worlds. They want that connection, so it at least seems obvious that the real world is the real ultimate stage for virtual worlds." Like Damer, Paffendorf sees the beginnings of this complex future virtual world in the recent preponderance of augmented reality apps "that let you look through the camera to see things that aren't physically there: Either data overlays like directions or where tweets are coming from or a digital doggy prancing on your kitchen counter." Despite their limited utility, Paffendorf suggested, those kinds of apps are far more compelling to a lot of people than existing virtual worlds like Second Life. "You can see the signs that that's a very compelling experience for people," he said. "I think on a deep level, that's irresistible for people. The feeling of putting imagination on the outside of your body, or seeing the world in new ways that (are) either more informative or more satisfying emotionally or conceptually." In fact, Paffendorf has a term for this: the "gravity of reality." "It seems like even in pure virtual worlds, you always get pulled back to real world references," he said, "because not only are they socially and culturally familiar (but) they go back to all of our biological evolutionary underpinnings. The real world wins, so all the augmented reality things are going to be especially compelling, because they're reality, but plus-plus." For some of those involved in making "Avatar," the idea that the technology behind the film could indicate the beginning of a new era for virtual worlds makes a lot of sense. In part, that's because it's clear, in watching what Cameron and his team achieved with "Avatar," creating an entire world with computer graphics and then directly integrating acting performances, that something new and exciting is going on. The question is, will it benefit anyone besides the filmmakers? "What we were doing, virtual production in a virtual world, right now it's at a business to business level," said Jon Landau, the producer of "Avatar." "Ultimately, it's going to be at a consumer level. People (will) go in and record their stories and present their stories, just like they do (now) with YouTube. Virtual worlds are another avenue for people to be creative and tell stories." Further, Landau said, today's virtual worlds are already knocking at that door. The only thing missing, he said, "is the virtual camera, where you use it the same way you'd use a regular camera." That, of course, is what Cameron did on "Avatar." But as Landau said, for now, that's a tool--at least for incorporating rich real-world imagery directly into a virtual environment--that's only in the hands of businesses. But as we've seen with forthcoming projects like Project Natal, that is changing soon. And while it's too early to tell how much Natal will impact virtual worlds, there's little doubt that technologies like that will someday soon impact people far and wide. "I don't think that's that far away from the home," Landau said. The biggest danger at the moment for those who want to see rich, 3D virtual worlds take off right away is the massive popularity of social networks like Facebook and Twitter. Paffendorf said that there's little doubt that the Second Lifes of the world missed an opportunity to give mass numbers of people the kind of personal connection they really wanted, and that the key is to find a way to mix the virtual and the real. Only a few minutes of Facebook can help people satisfy that need. But they will want more down the line, and that's something that fully immersive experiences will have to offer. "Facebook's got the mojo going," Paffendorf said. "But the future's not going to be all text and Flash windows. The fact that it is right now speaks to the deep human desire for real life connections and instantaneousness that new types of virtual worlds have to learn from. But I can't see it stopping there...I see social networks like Facebook that put everyone in the real world one click away as the foundational piece that was missing from a lot of last generation virtual worlds. Now there's a new wheel to build on.